There is no doubt that to fully appreciate this hill an approach must be made from the western seaboard, where ground falls precipitously over 1000ft to a battered Atlantic coast. I started from Glencolumbkille - giving a walk to the top of 15km and 4.25 hours along some of the most spectacular scenery in the country. Parking at 526874 C, beside a slipway to the tidal reaches of the Merlin river. A short road walk brings a track uphill to a signal tower at 222m (all part of a waymarked loop walk). The stunning views are turned up here and the dial can only go higher. A filmsy fence separates the 200m drop as walk along the clifftop to the dramatically jagged height of Sturrall. Walk along lower cliffs to the little harbour at Port (548890 D), surrounded by hills and striking seastacks. Could also start from here as there is ample parking. Climb up from sea level to cliffs over 200m again on Port Hill before dropping steeply down to the Glenlough river (572910 E) - above one of the most dramatic storm beaches you are ever likely to see. 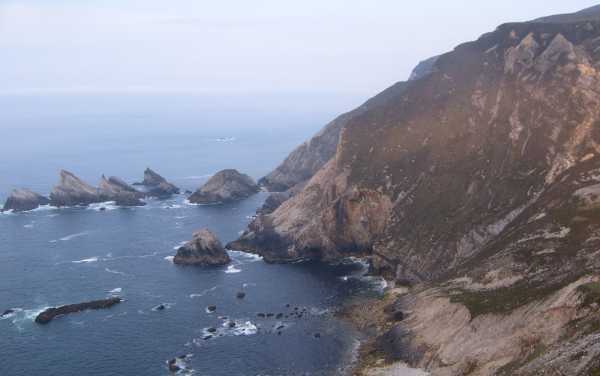 Now the climb is really on as gain sight of the line of high cliffs where Sliabh Tuaidh meets the Atlantic and spawns a myriad of different sized and shaped seastacks. Continued height gain brought me to a point where the GPS read 365m to the water below. Rising air created mist near the top of the cliffs and hugged the ground at the top before disappearing. In this period of murk the seastacks took on an other worldly appearance and shafts of light created biblical areas of golden calm out to sea. Head S for the top as the ground starts to drop along the coast towards Gull Island, looking across to Lough Anaffrin nestling below steep slopes. The top is quite stoney and has a number of small cairns. Views extend back along the coast already walked and north along coast to come, the height of Errigal and the Derryveagh mtns and the Bluestacks, south over Donegal Bay to the sharp line of Benbulben and the low line of the Ox mtns.